Everyone who’s studied basic science at school knows that light travels much much faster than sound. Light can travel about 300,000 km in a single second. Sound, in the same time would cover about 0.3 km. That’s a huge difference. Considering that, it is fairly easy to calculate how far a lightning strike happens by measuring the time it takes the sound to reach you after you see the lightning. In that case, taking into account the enormous speed of light, you assume that the light instantly reaches you and you just count the seconds it takes for the sound to be heard at the place you are. Then multiplying the seconds with 0.3 would give you, in kilometres, how far it happened – an estimation of, course. So, if there isn’t a mess of lightning strikes happening somewhere, which usually isn’t the case, and if you can clearly tell which sound came from which lightning strike, which you can’t in most cases, you can actually estimate the distance of a strike very easily. How to estimate the temperature. 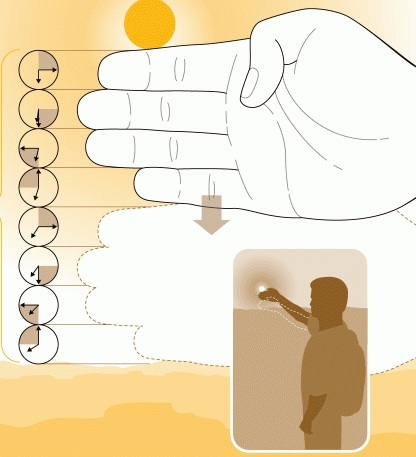 and How to estimate the time to sunset. An annoying Cricket’s treet-treet-treet noise is really unbearable sometimes, especially when a house cricket ends up under your bed and treets all night long. To others, it’s pleasing, they associate it with the night time, and it makes them go to sleep. Whatever it is for you, there’s one interesting thing universal about that noise they make. If you can count the number of chirps, you can almost accurately estimate the atmospheric temperature using a simple formula! Good ‘ol farmers used to do this. I know all of us have smartphones these days, so counting cricket chirps to estimate temperature probably makes no sense to you. Still, I’ve said it back then and I say it again, it’s never bad to know anything. For doing it, you somehow should be able to measure 14 seconds. In those 14 seconds, count the number of times a single cricket chirps. Suppose there are 35 chirps heard, you save that number and add it to 40 (always 40). And this gives you the present temperature in Fahrenheit. Now, since only a handful of countries use Fahrenheit to measure temperature, you might want to convert it into Celsius scale. I personally am comfortable with only the Celsius scale. But you don’t have to go through the trouble of converting because, to measure the temperature in Celsius scale using the cricket’s treet, this is what you have to do. To know that it is first important to understand how a cricket makes that sound. Remember only male crickets of a few species make this sound. They do this by a process called stridulation – rubbing 2 body parts to make a sound. Rubbing the underside of one wing with the upper side of the other wing does this trick – as they have rough and hard structures over there.